"All you have to do is push the button." 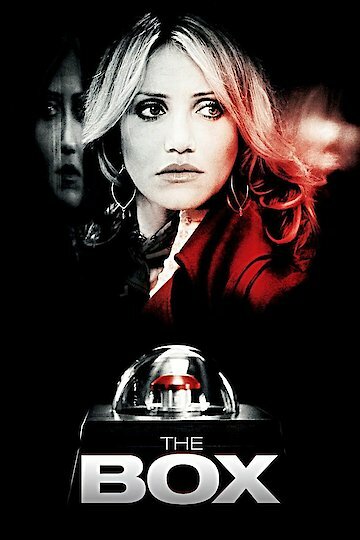 The Box, based on the 1970 short story Button, Button by Richard Matheson is set in 1976 Virginia. One early morning as Norma (Cameron Diaz) and Arthur Lewis (James Marsden) are lying in bed, the doorbell rings. Finding a package at the doorstep, Norma brings it in and upon opening she and Arthur find a wooden box with a button covered by a glass dome. There is a key inside and a note that states at 5:00pm Mr. Steward (Frank Langella) will return. Setting the box aside the two, along with their young son Walter (Sam Oz Stone), go on about their day. The day takes a downward turn for both Arthur and Norma soon after, both discovering that their financial situation and their career paths may not be panning out the way they had planned. That evening, at 5:00pm Norma answers the door and Arlington Steward, with half of his face missing, is there. He tells her that if they choose to push the button someone in the world (that they do not know) will die, and they will receive a million dollars. He exits by telling her that they have 24 hours to decide. Once Arthur returns home, they go back and forth with what to do when Norma suddenly moves forward and hits the button. What follows is one stunning and seemingly coincidental event after another while the two begin to regret their decision almost immediately. The pair receive warnings every where they turn, and are desperate to find a way to stop it. Once Mr. Steward confides that when the box is passed on the next person to die with either be Arthur, Norma or Walter they begin to panic. From here, the couple realizes they have decisions to make and agree that Walter’s life, above all else, will be protected. Try as they may, they know full well that one of them may not make it out of this alive. The Box is currently available to watch and stream, buy on demand at Vudu, Google Play, FandangoNow, iTunes, YouTube VOD online.